Text by Lara Cardoso, MA Media, Communications & Critical Practice (LCC) and Photos by Camilla Glorioso, MA Fashion Photography (LCF). Made in Arts London’s (MiAL) latest independent exhibition ‘Intersection’ showcased a selection of work from UAL’s top emerging artists and designers at the Hoxton Arches in Cremer Street..
A platform nested within the Students’ Union, MiAL is a not for profit enterprise that sells and promotes student art. 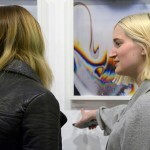 Representing students and alumni from all six colleges with two annual collections plus an array of independent exhibitions such as ‘Intersection’ – MiAL seems to be UAL’s best kept secret. 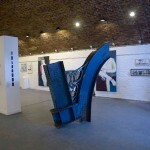 Walking into Hoxton Arches for the ‘Intersection’ private view was spectacular. The gallery was buzzing with excitement and it was wonderfully encouraging to see fellow student work displayed in such a well-crafted and lively space. Even more encouraging? 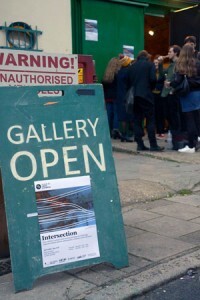 Many of the artists featured in ‘Intersection’ were current postgraduates or recent alumni! Monica Alcazar-Duarte recently completed her MA in Photojournalism and Documentary Photography at London College of Communication. Monica exhibited her interactive installation and photobook, ‘Astro’ which investigates how audiences read and connect with images and information. Crazy fun and interactive – ‘Astro’ was a highlight of the exhibition especially when discovering the many bobs, bits and facets of the installation! 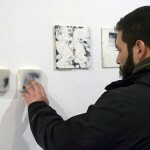 Giulia Cacciuttolo is studying her MA in Painting at Wimbledon College of Arts. For ‘Intersection’ Giulia collaborated with fellow artist-friend Sebastio Castelo Lopes studying MA Drawing also at Wimbledon. 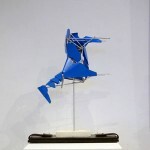 Together their work questioned audience reactions to the composition and material of particular objects. 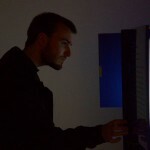 Cadi Froehlich recently graduated with an MA in Fine Art from Camberwell and Chelsea College of Arts. 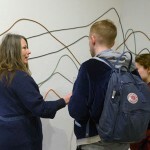 Cadi exhibited a beyond instagrammable work of wires created from online data collection. Cadi requested her fellow exhibiting artists to complete a survey regarding their artist experiences. Each wire represents a different artist and the dips, curves and heights represent how each artist feels during their creative process. Pamm Hong is currently studying her MA in Material Futures at Central Saint Marting. Pamm’s prints are mesmerisingly futuristic as she approaches her work through art, craft, science and technology. ‘Intersection’ was overflowing with contemporary inspiration and talent and this unique platform is one to be explored and praised for it’s efforts in supporting students creative careers.